Poster by student author Katie A. Quinlin. Plastic waste affects a plethora of marine and terrestrial organisms. In the previous section you learned about one affected seabird, the albatross. 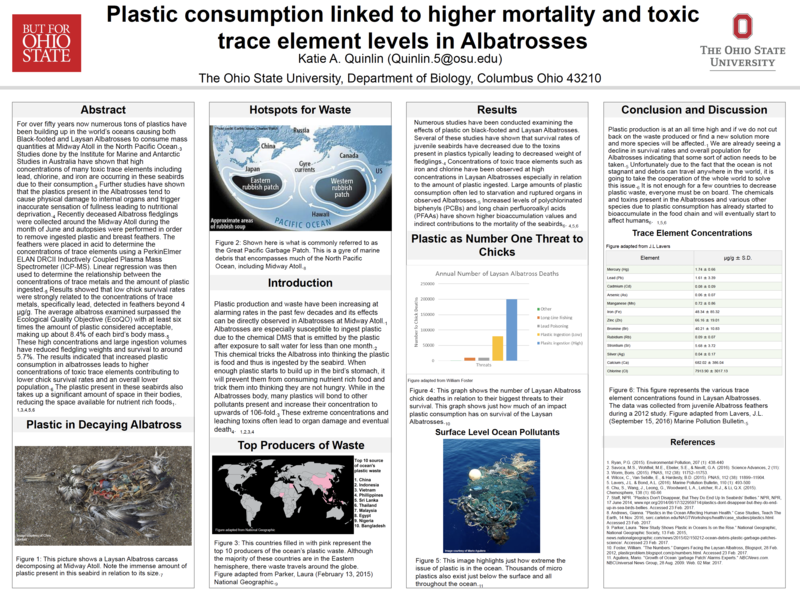 Read the entire transcript of the poster below to discover more about how the consumption of plastic materials is altering the albatross’ life cycles. For over fifty years now numerous tons of plastics have been buildings up in the world’s oceans causing both Black-footed and Laysan Albatrosses to consume mass quantities at Midway Atoll in the North Pacific Ocean. Studies done by the Institute for Marine and Antarctic Studies in Australia have shown that high concentrations of many toxic trace elements including lead, chlorine and iron are occurring in these seabirds due to their consumption. Further studies have shown that the plastics present in the Albatrosses tend to cause physical damage to internal organs and trader inaccurate sensation of fullness leading to nutritional deprivation. Recently decreased Albatross fledglings were collected around the Midway Atoll during the month of June and autopsies were performed in order to remove ingested plastic and breast feathers. The feathers were placed in acid to determine the concentrations of trace elements using a PerkinElmer ELAN DRCII Inductively Coupled Plasma Mass Spectrometer (ICP-MS). Linear regression was then used to determine the relationship between the concentrations of trace metals and the amount of plastic ingested. Results showed the low chick survival rates were strongly related to the concentrations of trace metals, specifically lead, detected in feathers beyond 4 ug/g. The average albatross examined surpassed the Ecological Quality Objective (EcoQO) with at least six times the amount of plastic considered acceptable, making up about 8.4% of each bird’s body mass. These high concentrations and large ingestion volumes have reduced fledging weights and survival to around 5.7%. The results indicated that increased plastic consumption in albatrosses leads to higher concentrations of toxic trace elements contributing to lower chick survival rates and an overall lower population.6 The plastic present in these seabirds also takes up a significant amount of space in their bodies, reducing the space available for nutrient rich foods. Figure 4: This graph shows the number of Laysan Albastross chick deaths in relation to their biggest threats to their survival. This graph shows just how much of an impact plastic consumption has on survival of the Laysan Albatrosses. It is a bar graph of annual number or Laysan Albatross deaths with the number of chick deaths on the y axis and the type of threats on the x axis. Figure 5: This image highlights just how extreme the issue of plastic is in the ocean. Thousands of microplastics also exist just below the surface and all throughout the ocean. Ryan, P. G. (2015). Environmental Pollution, 207(1): 438-440. Worm, Boris. (2015). PNAS, 112(38): 11752-11753. Wilcox, C., et al. (2015). PNAS, 112 (38): 11899-11904. Lavers, J.L. & Bond, A.L. (2016). Marine Pollution Bulletin, 110(1): 493-500. Chu, S., et al. (2015). Chemosphere, 138(1): 60-66. Staff, NPR. Plastics Don’t Disappear, But They Do End Up in Seabird’s Bellies. NPR, 17 June 2014. Accessed 23 Feb. 2017. Andrews, Gianna. Plastics in the Ocean Affecting Human Health. Case studies, Teach the Earth. 14 Nov. 2016. Parker, Laura. New Study Shows Plastic in Oceans is on the Rise. National Geographic, National Geographic Society,13 Feb 2015. Fister, William. The Numbers. Danger Facing the Laysan Albatross, Blogspot. 28 Feb 2012. Aguilera, Mario. Growth of Ocean garbage path alarms expert. NBCNews.com. 28 August 2009.